The explosive growth live streaming video has seen is due in large part to the profound effect social media has had on video consumption. For example, social media giants Facebook and Twitter deliver live and on-demand video content respectively to millions of active users' newsfeeds on a daily basis. Looking ahead, all bets are on live streaming video taking an even greater leap from emerging trend to mainstream necessity as its popularity and adoption continue to grow. 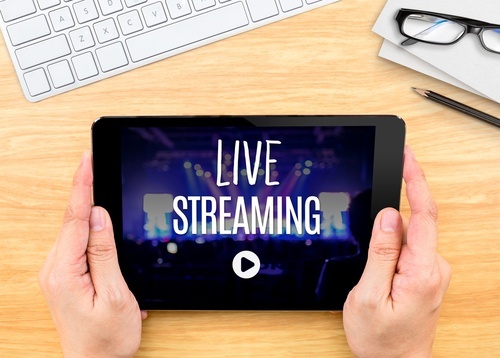 With an enormous opportunity to break through the digital content clutter, nonprofits should add live streaming video to their content strategy. Here are a few reasons why. Increased brand and cause awareness: Storytelling is one of the best ways to bring greater awareness to your nonprofit brand and cause. As with other forms of visual storytelling, live video can deliver authentic, personal stories that connect with audiences. But what separates live video from other content formats is its unique sense of urgency and its on-the-spot nature. When nonprofits broadcast live events, there’s an opportunity to attract a broader base of attendees that would otherwise not have participated. While your top donors, staunchest advocates, and most enthusiastic volunteers may opt to attend all your events in person, others who wish to learn more about your cause and organization may initially choose to observe your events online before making a commitment to attend in person. Live streamed events allow for this type of conversion. Improved community engagement: Live streaming video is also an excellent way to engage in real time with your community members. Consider hosting live Q&A sessions to learn more about your audience—including their habits, preferences, and the issues that concern them most. Responses to your questions can help you develop themes and topics for future content as you plan your editorial calendar. You might also consider conducting live interviews with cause influencers who can help you reinforce your brand mission and disseminate your messages more broadly and effectively. Direct, real-time interaction not only humanizes your organization, it also engenders trust and builds a deeper connection between your organization and your online community. Diversified content mix: Live streaming video is a rich, dynamic, easily digestible content format. Its true value lies in its capacity to inform, educate, and entertain. According to video streaming platform, Livestream, "live video is more appealing to brand audiences: 80 percent would rather watch live video from a brand than read a blog, and 82 percent prefer live video from a brand to social posts." If you’ve already had success with other forms of digital content (e.g., blog posts, social media posts, photos, e-newsletters, and others), the likelihood of boosting your overall content performance with high quality live video is quite strong. Has your nonprofit experimented with live video? Tell us about your experience in the comments below.